SocioViz is new born social media analytics platform powered with Social Network Analysis metrics; actually is available for Twitter but in the near future will be extended to other main social media channels. By default, specifying any other value, the last 100 tweets are extracted; clicking on From and To fields is possible to search 1 week in the past with a maximum of 5.000 tweets for each query. Actually two types of account are available: free and associate. Free accounts could search up to 100 tweets in the past, associate accounts unlock the search up to 5.000 tweets and one week in the past. You could associate following this link. Each row in the table represent a tweet. The table of tweets is downloadable in XLS format clicking on the upper right arrow icon . Influencer marketing, is a form of marketing that has emerged from a variety of recent practices and studies, in which focus is placed on specific key individuals (or types of individual) rather than the target market as a whole. It identifies the individuals that have influence over potential buyers, and orients marketing activities around these influencers. One of the metrics that could help to identify influential people in Twitter conversations is to measure the number of retweets and mentions received. Also the overall activity of a specific user (the number of tweets sent), is an important metric but it have to be carefully evaluated; in fact in the example above the most active use is a bot. 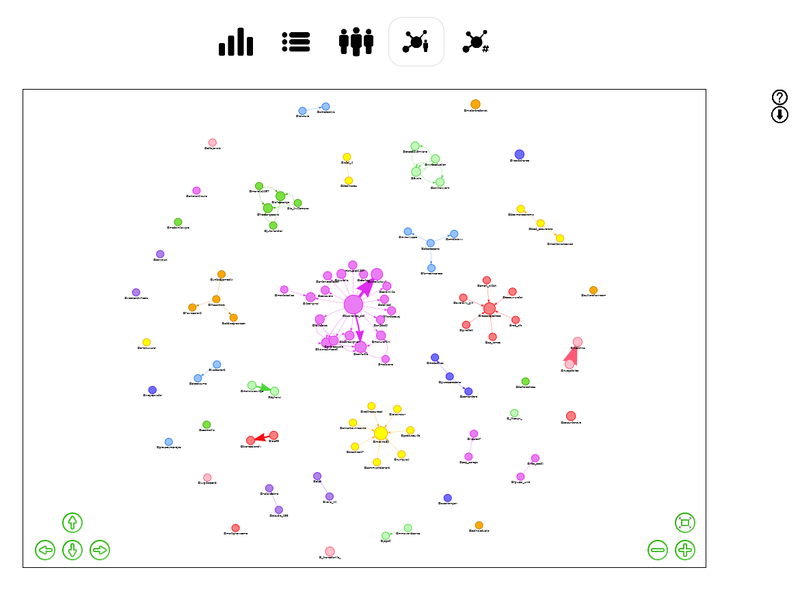 Each user is represented with a circle (a node) and is connected to another user when there are interactions between them (RT or mentions). The nodes size are proportional to the number of RT and mention received, so is a good indicator of the influence of a particular person in a network of conversations; different colors represents different community where the dynamic of interactions are more frequent. The network is downloadable in GEXF format clicking on the upper right arrow icon . GEXF is a language for describing complex network and is fully compatible with Gephi, one of the most used software for network visualization and analysis. Each hashtag is represented with a circle (a node) and is connected to another hashtag when there is a copresence in the same tweet; different colors represent different cluster of arguments that frequently goes together. The network is downloadable in GEXF format clicking on the upper right arrow icon . Starting from 26 October 2015 SocioViz is a not-for-profit corporation created to promote and spread the digital culture in all its form and to support future developments of SocioViz platform. SocioViz is and will be a available to anyone with some limitations. Associates unlocks additional and future features submitting their membership and paying the annual fee. Register to SocioViz and follow the heart icon for additional information. Inviato su Tool, TwitterTag Social Network Analysis, Twitter, Twitter APIBookmark the permalink. I have finally had the opportunity to test it. That’s a quite useful tool to extract and analyse quickly Twitter conversations. Are new features going to be added soon? Matteo, developers team are collecting suggestions from users. Have you got any particular idea or advice? Interesting, but I cannot get access to the web. Seems down. Anyway, do you know any similar tool to analyze hashtags in this level? And also that makes data available to play with Gephi? Hi Javier, the site is up and running. Please try again. Anyway I don’t know any other tool that analyze hashtag copresence form a SNA perspective. Thanks to the article was interesting! Hi Scott. The team is working on this. In the meantime you have geolocation and other infos available downloading tweets in excel format. 1) Do you think to overcome the limits of 5000 tweets and 7 days in the past (I mean: for associates)? 2) What about extending Socioviz to Facebook? Hi Raffaele. I know that developers team are working on new features. Drop them a mail to be included in beta tester list. Hi Samuel, with Socioviz you could query for 7 days in the past. For specific needs please drop a mail or a tweet to SocioViz team. Hi Zonin, do you provide services for Indonesia Language (Bahasa)…? 1 adding possibility to download by twitter list as in gephi or in nodexl? 2. or list of words, like 20 different hashtags? 3. this so that data is also dynamic. 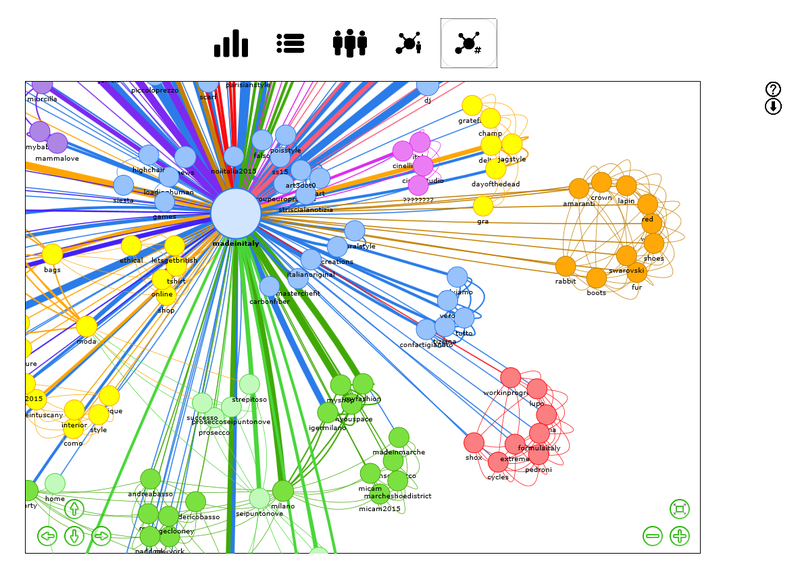 so that one can view that in gephi as well? site does not allow me to log on. also browser indicates the site is not safe. please repair/improvce.